The past couple of days we've had some awesome play dates with dear friends, and they've been such a breath of fresh air. It is so easy to be hard on yourself when you're flying solo. It is so easy to forget what normal looks like. Then I have an opportunity to chat with a fellow mother. As we share stories - the funny and the frustrating - I see how what happens in our home is not at all unusual. We aren't the only family who is imperfect. Actually, when you think about it, even the Holy Family wasn't perfect, since St. Joseph (poor guy) was not without sin. So, I'm sure he had his moments, too. I hesitate to talk about forming your "domestic monastery" because I think that some people hear that and think, "Whoa. My family isn't holy enough for that kind of thing. We aren't perfect. We yell/fight/get frustrated/drive each other crazy/cry." But having a domestic monastery isn't about being perfect. It's about falling down and refusing to stay down. It's about getting back up and trying again. It's about choosing to love. 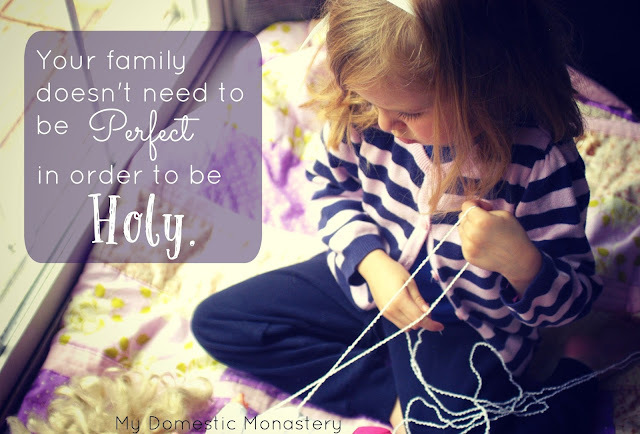 I just wanted to remind you today - your family doesn't need to be perfect to be holy. In fact, when I see you in your imperfection, it makes me feel less alone in my own imperfection. Your genuineness gives me hope and encourages me to not give up either.